This bulldog puppy is only 2 months old and he's completely incapable of standing, let alone walking. Bueller came to the Sacramento Society for the Prevention of Cruelty to Animals (SSPCA) late last week. 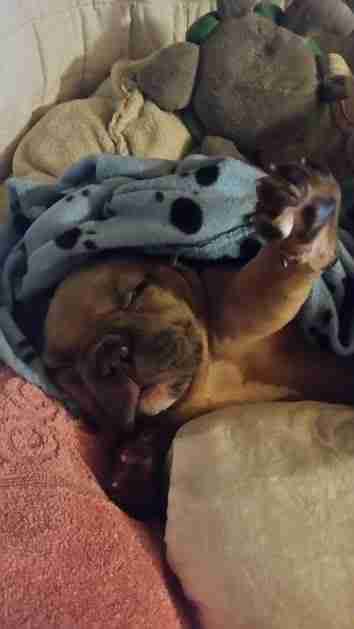 He was given up by a breeder who never took him to see a vet. It's been a whirlwind for Bueller ever since, as the SSPCA staff now works on getting his groove back. In this case, that means regaining his ability to do what dogs do best - run around and play freely to their hearts' content. Bueller was born with what is known as "swimmer's syndrome." 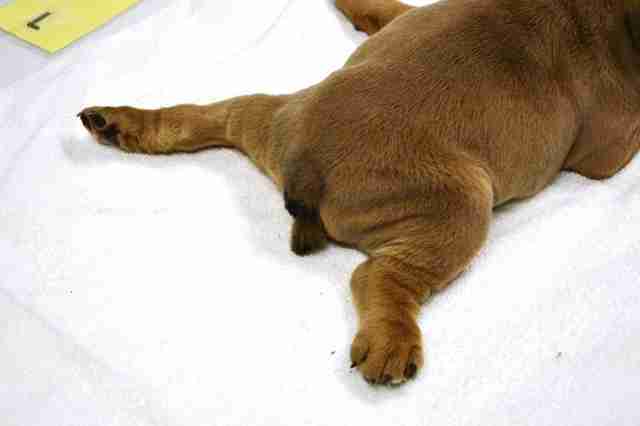 "Basically, it is a defect that causes a flat chest, and the legs and paws to 'splay' out like a swimmer or a frog. 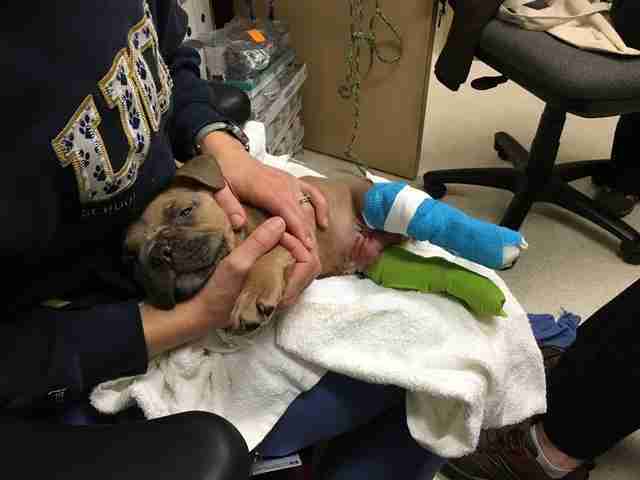 In Bueller's case, he is affected on all four limbs and is unable to stand, walk or lift up anything other than his head," Sarah Varanini, foster care coordinator at the SSPCA, told The Dodo. 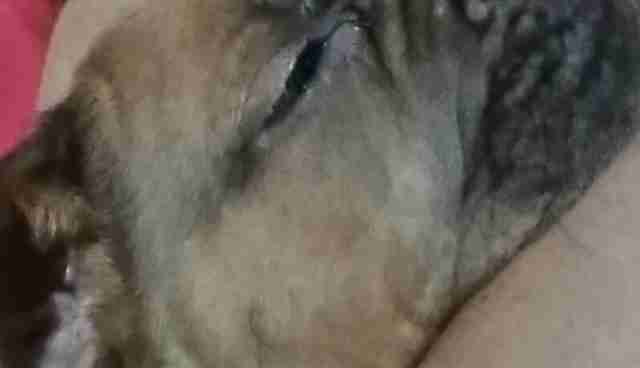 "It is a genetic defect and a good example of why breeding dogs with unknown medical histories is not a good idea," Varanini said. Normally, a puppy should be able to stand and walk by around three weeks of age. As soon as Bueller arrived, the SSPCA veterinary team immediately came up with a strategy to get Bueller standing on all four paws. "The usual course of action is to tape or splint the legs closer together in a more normal position," Varanini said. Another physical therapy activity the SSPCA is utilizing to help Bueller stand and walk is swimming. For about 10 minutes every day, Bueller does a session, where he is held in a tub of water to exercise the weak limbs associated with swimmer's syndrome. "We also found reports that water therapy [can help] puppies learn to move their legs and regain muscle tone," she said. "His foster parent also came up with the brilliant idea of building a 'baby bouncer' to help him learn to put weight on his paws and walk without needing to support his entire body weight," she said. But, according to Bueller's foster mom, he's not a fan of the baby bouncer and makes it known quite vocally. "He definitely has a lot of personality," Varanini said. "He has a hilarious habit of huffing and letting out long dramatic sighs when he's ready to stop his therapy. Quite the drama king! He also really loves the foster mom's boxer and is trying his best to play with him, although his limitations make it difficult." What the future holds for Bueller because of his defect remains unclear. "Our hope is that the therapy will be successful and he will be able to function like a normal dog," Varanini said. "It is too soon to tell, but we are being optimistic. Part of the problem is that bulldogs have somewhat odd [physical builds] anyway, so what 'normal' is for him, may be different than [for] the average dog." What we do know is that Bueller is one spunky pup with a loving foster family and a dedicated shelter team supporting him every step (or rather, swim) of the way. 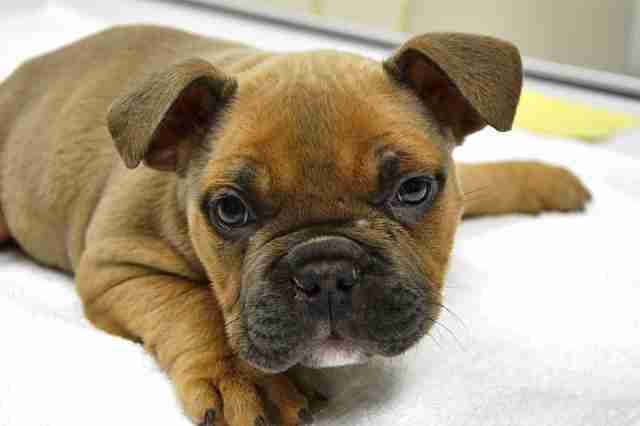 If you're interested in supporting Bueller, the SSPCA is raising money toward his care.